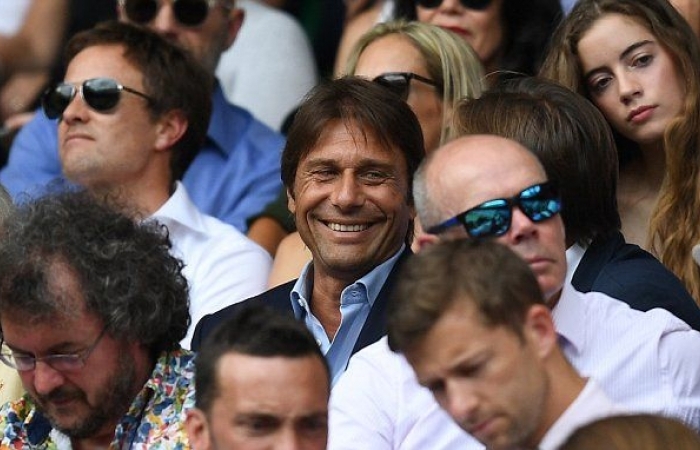 Chelsea were out in force at Wimbledon as Antonio Conte watched the historic clash between eight-time winner Roger Federer and Marin Cilic, and as the tennis ended the focus is now firmly on the new season. Rumours continue over Conte’s future, but the Chelsea faithful believe he is staying and that is reflected join a hike in the sale of the newly published book ‘King Conte’ which is on sale now at Waterstones on Amazon about the Italian manager’s career as a player and a manager, plus his first season with the Blues. Conte is manager of the football club which could be considered to be the All England Club’s neighbours, Chelsea, and there was a big turn out of Chelsea Spanish stars. Conte enjoyed his first visit to SW19 since becoming Blues boss last summer, but he was not the only representative of the Premier League champions, with a group of his players getting prime seats. Goalkeeper Thibaut Courtois, defender Cesar Azpilicueta and wing back Marcos Alonso were all among the spectators, and afterwards naturally grabbed a picture with the newly crowned women’s champion, Garbine Muguruza. Cesc Fabregas and his partner Daniella Semaan were also there but not in the royal box, which was perhaps a wise move on their behalf due to their dress code.